The Whitman-Hanson Regional High School is a state-of-the-art high school educational facility, approximately 233,693 square feet for 1,350 students. It has an 8,700 square foot library, an auditorium seating 850 people and was constructed on the same site as the existing high school, which remained in operation throughout the project. Ted Gentry Associates worked with the architect, superintendent of schools and the building committee to manage this complex facility into the budget and schedule outlined at the outset, and received a significant amount in rebates for energy conservation and green design features and was selected as the first model high school for Massachusetts. The school met the educational design criteria and also includes an athletic facility component that includes an indoor walking track above the 24,000 square foot gymnasium. Outdoor athletic facilities included a new synthetic football/soccer field with new running track surface as well as tennis, baseball, softball and soccer facilities on the site of the former high school. The Ventress Memorial Library is the Town’s public library. The feasibility study was to determine the design and cost for a Town Meeting vote to appropriate funds for what is potentially a $ 6million to $10 million project. The current library was housed in a renovated grocery store, completed in the 1980’s. It is impeccably maintained and managed but suffers from a lack of space for the collection, lack of technology, meeting space, meeting space and space in the children’s area. 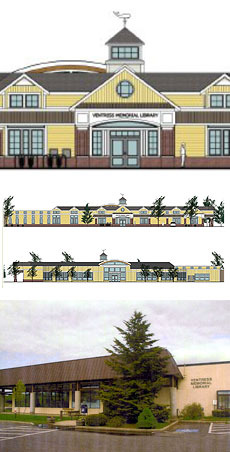 Ted Gentry Associates worked with the library building committee to manage the feasibility study including the selection of the designer to perform the feasibility study, comparing several site possibilities. A conceptual design was created and continued into schematic design and submittal for a MBLC grant. Plymouth Public Schools engaged Ted Gentry Associates as the owner’s project manager for the feasibility study/schematic design phase, to determine the most effective solution of either an addition/ renovation of their existing North High School or the construction of a new North High School followed by demolition of the existing facility. Working under the newly created guidelines of the MSBA and with Plymouth’s High School Building Committee, Ted Gentry Associates managed all aspects of designer selection, managing the feasibility study and schematic design to ensure they meet the School District's goals for program, schedule and budget. The project was selected to go into the model High School program and Ai3 were the chosen designers. As scheduling and phasing of the work was critical in the implementation of this plan, the plan was developed to maintain the currently overcrowded and is heavily used facility while a new high school is constructed adjacent to it. The project was competitively bid and J&J Contractors were selected as the general contractors and started work in the spring of 2010. The scheduled completion is Fall of 2012 for occupancy of the new 249,000 SF facility with demolition of the existing high school and completion of athletic fields and parking lots for 2013. Plymouth Public Schools engaged Ted Gentry Associates as the owner’s project manager, initially for the feasibility study/schematic design phase, to determine the most effective solution of either an addition to and renovation of their existing South High School or the construction of a new South High School followed by demolition of the existing facility. Working under the guidelines of the MSBA and with Plymouth’s High School Building Committee, Ted Gentry Associates will manage all aspects of selecting the designer, managing the feasibility study and schematic design to ensure they meet the School District's goals for program, schedule and budget. Scheduling and phasing of the work will be critical in the implementation of this plan as the building is currently overcrowded and is heavily used year round by many Town organizations. The Town of Plymouth engaged Ted Gentry Associates as the owner's project manager starting at the feasibility study/schematic design phase, to determine the most effective solution for a new Senior Center on the site of the existing and soon to be constructed New North High School. Working with the Director of Community Services and the Town's Permanent Building Committee, Ai3 Architects were selected as the designer of the project that would replace the existing rented facility for the Council on Aging. Ted Gentry Associates managed all aspects of designer selection, managing the feasibility study and schematic design to ensure they meet the Council's goals for program, schedule and budget. The design was developed to work with the new High School project for sharing of facilities, as well as design elements. Scheduling and phasing of the work with the new High School project was critical in the construction of this facility; constructing the new center while the new high school is constructed adjacent to it. The project was competitively bid and J&J Contractors were selected as the general contractors and started work in the spring of 2010. The Medford Public Schools engaged RF Walsh with Ted Gentry as project executive in the planning, development and construction management of the 5-building, 6 school program. Phase I involved 2 buildings on the 44 acre Hormel Field site adjacent to the Mystic River. One building is a combined Pre-K to 8th grade housing 1,250 students, the other a stand alone middle school for 600 students. Phase II consisted of 3 new K to 5yh grade schools on 3 sites including demolition of 4 existing school buildings. The total project consisted of approximately 300,000 square feet of new schools. As Phase I was moving towards completion, Phase II design work moved toward a bid date that would allow an orderly transition for the students of the Medford schools from the 14 older buildings into the newly constructed schools. When Ted Gentry founded Ted Gentry Associates, they were asked to stay on to completion of the project, which had approximately 9 months remaining. The project included an OCIP and PLA that were negotiated at the outset of Phase I. The project was completed with change orders maintained at less than 1%. The New Central Fire Station Building project is a significant public works project in the Town of Hingham. Selected as the Town's chair of the building committee buy the Town Moderator, Ted Gentry provided leadership for the preconstruction services for a new/renovated $6 million central station.